Although actually in Holne parish (see map in Local Administration, under Gathering Together), Holne Park is so close to Ashburton that the town frequently features in the address. 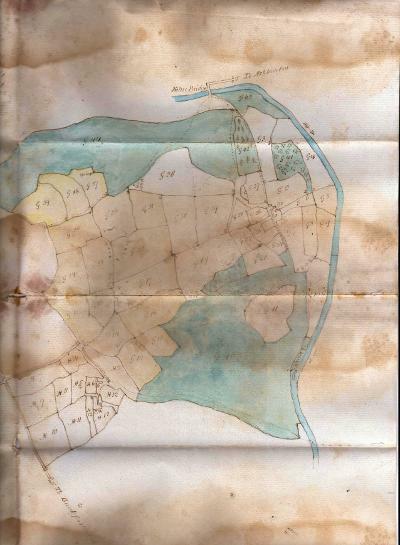 ...The manor of Holne and Holne Chace were formerly part of the barony of Barnstaple, and passed (with Tawstock) successively to the Audleys and Bourchiers (Lords Fitzwarren and Earls of Bath) from whom they descended to the present possessor. Some residents of Holne Park. 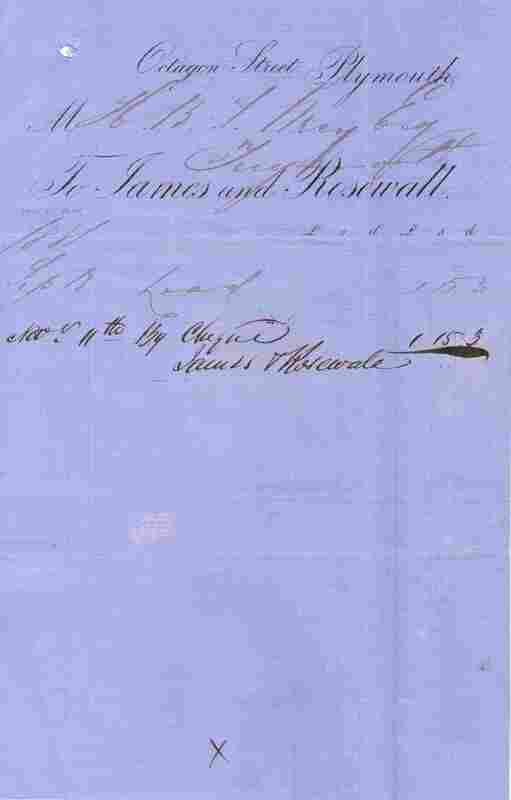 Many seem to have taken short term tenancies, and the Wrey family are mentioned until at least 1884. 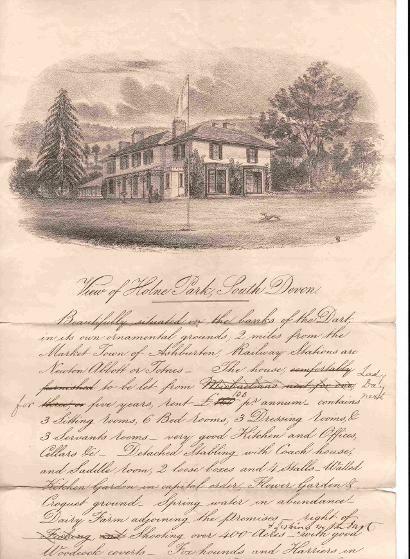 A newspaper article (below) says that the Hon R Dawson purchased the property in 1886 from Sir Bourchier Palk Wrey. In April 1885 a gardener named I. Russell is seeking work - cause of leaving 'death', and in May a coachman, 'J', is leaving for the same reason. Clergymen married. 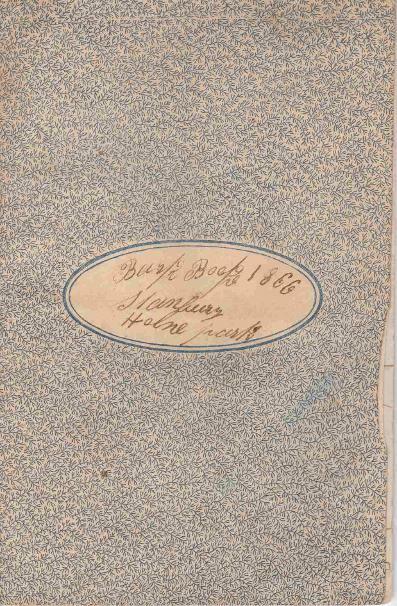 The Rev Henry Bourchier Wrey of Holne Park, Devon, to Ellen Maria, only daughter of N R Toke Esq. of Godington, Kent. 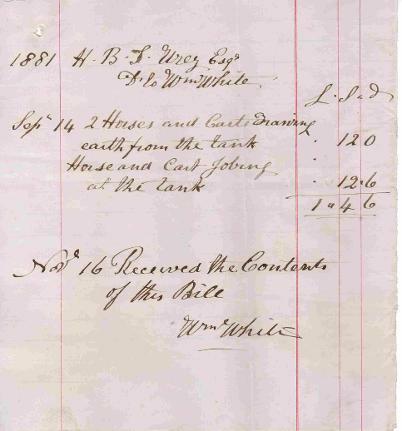 *John Stanbury, of Holne Park Cottage, is available to show a farm to prospective purchasers, and is named as the woodman of Holne Park in 1878. 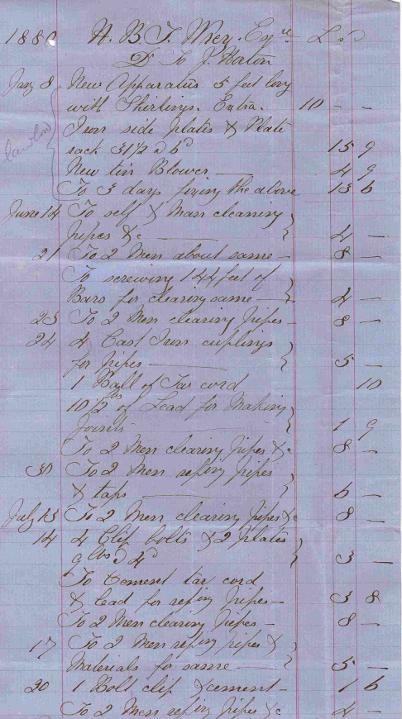 In 1855 mine machinery and materials from the South Plain Wood Mine were sold by Mr Creagh. Included in the sale was two buddles, hand screw, horse whim, cobbing irons etc. Mining began in 1850, and it was reported two years later that 'powerful machinery' was installed there, operated by water from the Dart. In June 1854 several tons of copper had allegedly been sold from the mine. 3. That no person shall retract his or her bidding. 7. Whatever damage may be done in felling or removing any wood or bark must be paid for or repaid and made good by the respective purchasers. 17. The purchasers shall pay to the auctioneer the sum of five shillings on each lot. All are witnessed by Geo Caunter. 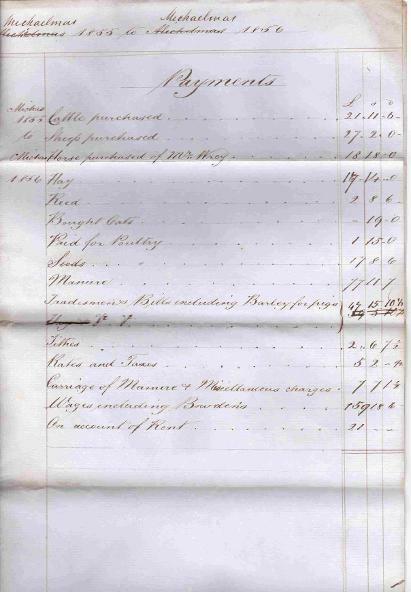 John Maddick paid £12 2s 6d per acre for coppice in North Park Wood; John Hent paid £13 5s. 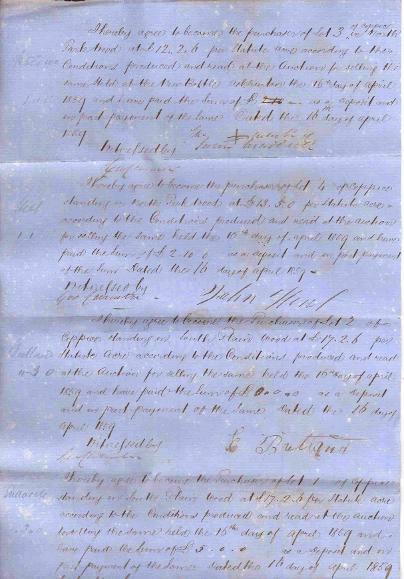 E Butland paid £17 2s 6d per acre in South Plain Wood, as did Jacob Endecott. Beautifully situated on the banks of the Dart in its own ornamental grounds, 2 miles from the Market Town of Ashburton. Railway Stations are Newton Abbot or Totnes. 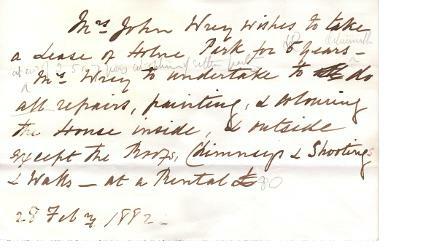 The house, comfortably furnished (last two words crossed out), to be let from Michaelmas next for three (last four words crossed out) Lady Day next for five years, rent £100 per annum, contains 3 sitting rooms, 6 bed rooms, 3 dressing rooms, & 3 servants rooms - very good kitchen and offices, cellars, etc. Detached stabling with coach house, and saddle room, 2 loose boxes and 4 stalls. Walled kitchen garden in capital order, flower garden & croquet ground. Spring water in abundance. Dairy farm adjoining the premises - right of fishing and (last two words crossed out) shooting over 400 acres, (then inserted) and fishing in the Dart, with good woodcock coverts. Foxhounds and harriers in the neighbourhood. The house is approached by a carriage drive from a lodge entrance. 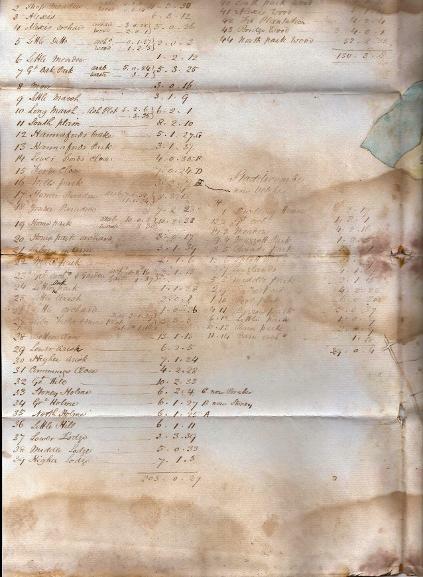 It lies between the road to Ashburton - top of the second page - and the road to Buckfastleigh - across the left hand corner of the second page. When advertised, the property was to be let for 3 or 5 years. James Anthony Froude had been baptised at Dartington in 1819 (born in 1818), the son of Rev Robert Hurrell Froude and his wife Margaret. 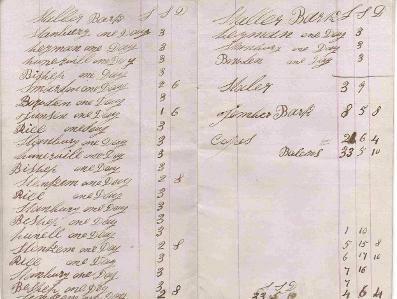 Right: The estimate of Thos Hext, Mason. 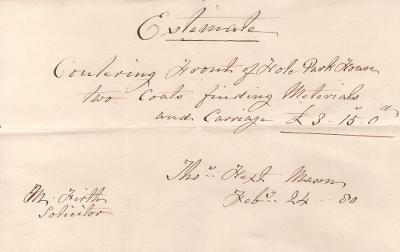 Left: A bill presented by John Eddy to Mr J Wrey*, for work carried out in 1881. The account, for £11 1s 1d, includes repapering, whitening ceilings, painting and varnishing various doors and skirtings, staining and varnishing the best staircase, painting floors and repairing garden frames. 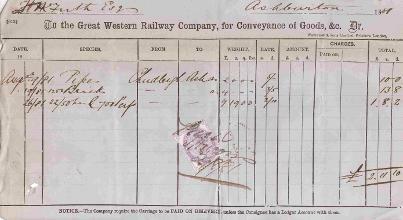 The bill was paid in two instalments, one in May and one in August 1882. Right: The water works were also overhauled. 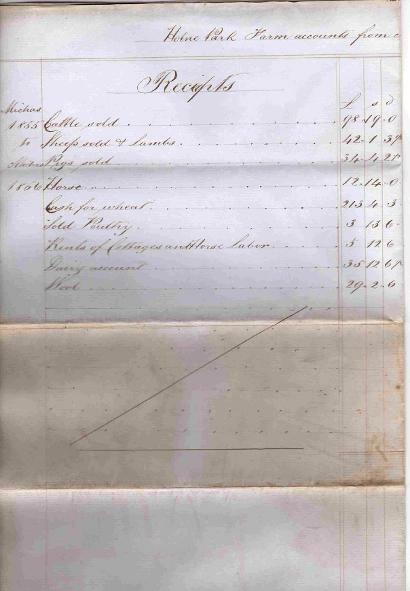 This is a bill from Henderson and Son, Civil engineers and Surveyors, of 31, Lemon Street, Truro. 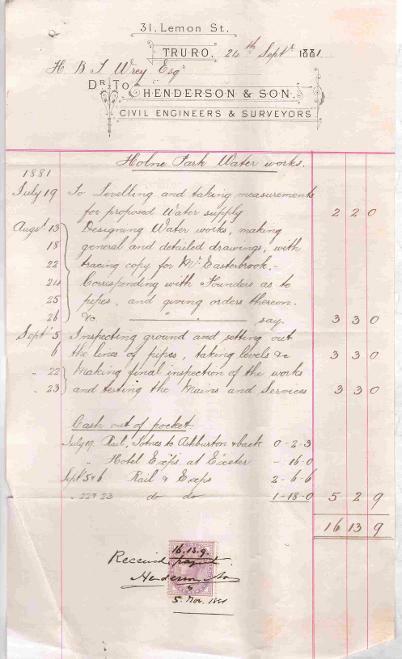 The account was for levelling and taking measurements for the proposed water supply, designing the works and making detailed drawings, inspecting and testing the mains and services. Some 'Cash out of pocket' expenses included rail travel and staying at a hotel at Exeter. 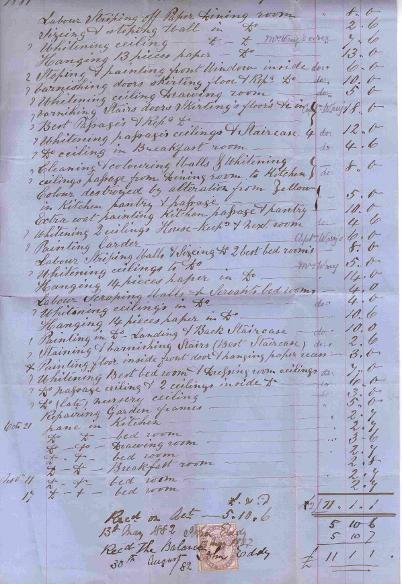 Below: Some of the materials arrived by train at Ashburton. Left and below: More work connected to the water works. In 1881 Mr J (?) 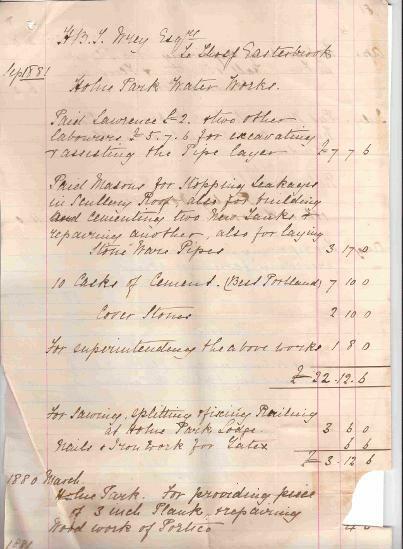 Edgecombe sent a bill (above) for drawing 2 tons of pipes to Holne Park, together with 14 tons of bricks and 3 tons 10cwt of iron pipes. 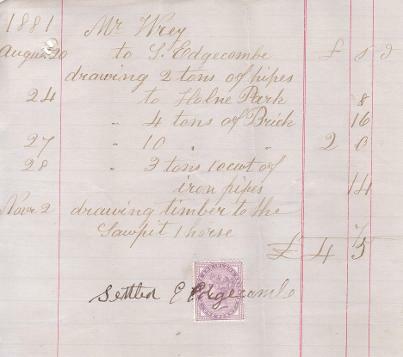 He also charged 7s for drawing timber to the sawpit - '1 horse'. Meanwhile Thomas Easterbrook (below) had, amongst other work, paid Lawrence and two other labourers for excavating and assisting the pipe layer. 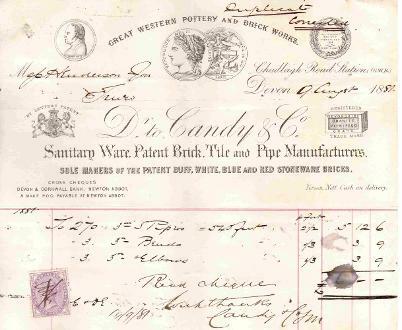 Left and below: Some of the materials - bricks, pipes, bends and elbows - came from Candy and Co.
Left: Some pipes and associated materials came from Scotland. 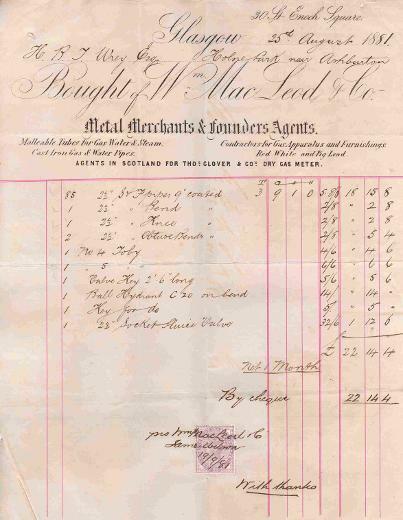 This bill is from William MacCleod and Co., 30, Enoch Square, Glasgow: Metal merchants and founders agents. The Hon R Dawson died during an operation in London in August 1914. He was Lord of the Manor of Ashburton, and had at one time been the Unionist candidate for the Mid-Devon Division. Captain Richard Long Dawson, Coldstream Guards, died 3 months later on 20 November 1914. He was the only son of the late Hon R Dawson and Mrs Dawson, Holne Park. For more on Captain Dawson, see Bob Shemeld's research under Roll of Honour WW1 A-F, under Ashburton in Peril. 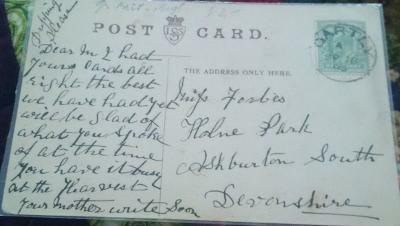 Right: A postcard to Miss Forbes (which says 'Dear M') at Holne Park. The date appears to be 1916. The card continues 'You have it busy at the harvest', which suggests that she was working at the Park, rather than being a guest. The card was posted from Gartly, a village on the main Aberdeen to Inverness railway. 1921 A fancy fair was held in the grounds of Holne Park with the permission of Mrs Mason. The fair was held to raise funds for the renovation of Holne Church, and about 1000 people visited the grounds. There were various stalls, including a produce stall supervised by Mr Thorne, the gardener at the Park. A bronze memorial to the late Hon Mrs Jane Emily Dawson, of Holne Park, was unveiled at Holne Church in 1934. Born in 1855, she was the widow of the Hon Richard Dawson, who had bought the property in 1886 from Sir Bourchier Palk Wrey. She died in February 1932. By 1940 Holne Park was a 'first class country house hotel' in search of a chef. The candidate, who had to be reliable and sober, could expect to earn £4 weekly. Applications were to be made to the Manageress, telephone 317. 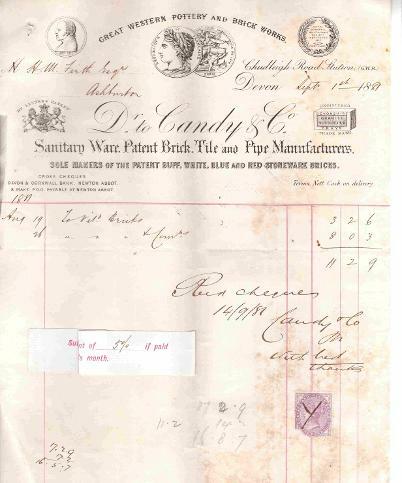 When Frank Joseph Rogers died in 1948, he left £25,932 2s gross, £25,601 4s 1d net. 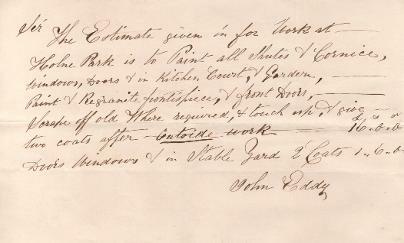 Formerly of Holne Park, Ashburton, he left various bequests, including £50 each to people who had worked for him: Bray (gardener), Sanders (carter), Leaman (woodman), Crocker (mason) and Townsend (carpenter). In 1955 Holne Park Hotel was advertising in the Yorkshire Post and Leeds Intelligencer as an 'excellent touring centre'. There was h and c (hot and cold water) in all bedrooms.